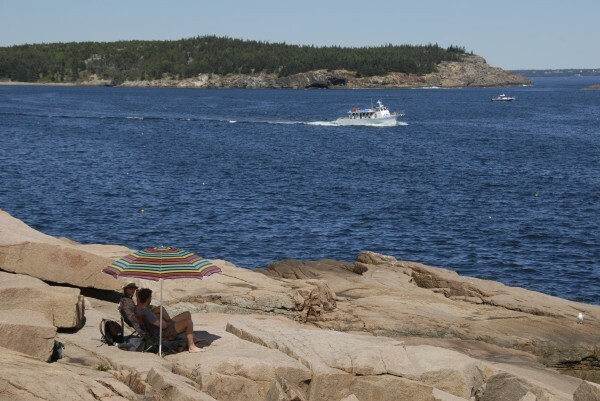 As a Bar Harbor cruise boat steams across Newport Cove, two tourists relax beneath a beach umbrella set up on the granite shoreline near Ocean Drive in Acadia National Park in this September 2012 photo. BAR HARBOR, Maine — This town, known worldwide as a great place to visit, has received another tourist-related accolade from TripAdvisor. In a list released Tuesday, Bar Harbor was ranked fourth nationally among the travel website’s Traveler’s Choice Awards for Destination on the Rise. Kailua-Kona, Hawaii; Anchorage, Alaska; and Destin, Fla., were the three that ranked higher. Locations that Bar Harbor beat out in the top 10 include: Brooklyn, N.Y.; Santa Fe, N.M.; Jackson, Wyo. ; and Gettysburg, Pa., among others. The list is based on reviews and comments submitted to the website by travelers. Chris Fogg, executive director of the Bar Harbor Chamber of Commerce, said Tuesday in an email that he is “very excited” that Bar Harbor made the list. Bar Harbor, located on the ocean and just outside Acadia National Park, attracts millions of visitors each year, the vast majority between Memorial Day at the end of May and Columbus Day in mid-October.